Six months ago, Scott Styris' international career was on the rocks after he was axed from the one-day side for the home series against Bangladesh. The drop came barely four months after his recall for a limited-overs series against Pakistan. How many can make two international comebacks after turning 34? Yet, Styris is now firmly back in New Zealand's plans for the 2011 World Cup, and he gave another demonstration of his usefulness on a tricky Dambulla track to set his team up for a victory that pushed them to the No. 2 spot in the ICC rankings. An inexperienced New Zealand side wasn't given much of a chance coming into the tournament and it seemed to show why when it tumbled to 28 for 3 in the face of a hostile new-ball spell from Ashish Nehra and Praveen Kumar. That brought together Styris, the most experienced man in the line-up, and Ross Taylor, their captain and most important batsman. The two senior players just about managed to survive the next few overs, before getting more settled once the spinners were brought on. Styris, in particular, had a nervous beginning. There was an lbw appeal from Praveen which Hawk-Eye suggested would shave the outside of legstump, a close caught-behind shout in Abhimanyu Mithun's first over, before being saved by the height on being struck in front of middle by Mithun's stock incutter. His biggest reprieve was a missed stumping off Pragyan Ojha when he was beaten by the turn after waltzing out of the crease, but the sharp spin meant Dhoni also failed to collect cleanly. By then, the pair had added more than 50 runs with Taylor unleashing a bunch of boundaries. With Mithun suffering a heat stroke and the senior quicks having already bowled plenty of overs, Styris then cashed in on some amiable left-arm spin. Boundaries off Ojha and Ravindra Jadeja were mixed with sensible singles and before you knew it New Zealand had moved to 150 off 30 overs. Then Taylor risked taking the batting Powerplay early. Styris' boundary-count shot up in those five overs, at the end of which 300 was in New Zealand's sights and the two batsmen seemed to be in a race to reach triple-figures. Styris drew level with Taylor on 89 with a straight swing for six off Ojha but a fifth ODI century eluded him when he was dismissed two balls later. On a pitch where 240 was talked of as the par score at the toss, Styris had piloted New Zealand to 219 for 4 with more than ten overs to go. "The bounce is spongy here. It's not true bounce as at WACA or some of the pitches in South Africa. It's a tennis ball bounce. On top of that it spun fast," Styris said after New Zealand completed their win. "It was particularly tough to bat on and that's why Ross and I are particularly pleased with the runs we were able to get." 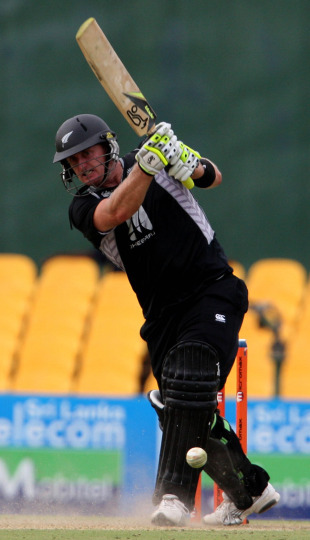 The 200-run victory was New Zealand's biggest over India. "We are obviously delighted with the result," Styris said. "We were missing [Brendon] McCullum and [Daniel] Vettori and perhaps we didn't have the same respect from the opposition and the media." Today's performance extends a rich vein of form for Styris, who kickstarted his attempt to re-cement a place in the one-day side with a cool 34-ball 49 in a big chase against Australia in his first match on comeback. He put in four solid contributions with the bat in five games that series, and has continued the run during his stint with Essex over the New Zealand winter. With emergence of Grant Elliott and the presence of Jacob Oram, New Zealand aren't exactly short on medium-pace allrounders and the competition for spots remains fierce. "Some nine-ten months ago I was a bit on the outer, which was disappointing. But since than I have done well in domestic cricket, in the series against Australia and for Essex," Styris said. "Always wanted to play in the 2011 World Cup and if you put performances on the board you have the right to be picked." It's been a long time since Styris bowled his full quota of overs, but he insisted there was no move to play as a specialist batsman. "I still want to have a big role with the ball, I have a couple of niggles that are holding me back a bit but I think over the next 6-8 months I will continue bowling hopefully a lot of overs," he said. "While in the past I have bowled 10 overs in every game, maybe now I'll bowl six to seven overs in each."